Last year’s cold winter/dry growing season pattern repeated itself to an even greater degree during 1856 across Minnesota Territory. The 1855-56 winter (December-February) was the second coldest so far in local climatic history, and for the fifth year out of the last six, March had bouts of unseasonable cold. Continuance of the ongoing trend in place since ‘48, December brought more premature arctic cold; not quite as severe, however, as 1855’s. Annual mean temperature at Fort Snelling (41 F) tied for second lowest in history; May-August rainfall was less than half of normal, total precipitation for the year around 22 1/2 inches. A Winter of “Unusual Severity” – The 1855-56 cold season (arbitrarily using November to March) was easily the coldest and most protracted of any thus far in the Minnesota Territorial history, and, using the Fort Snelling span of records up to this time, second only to 1842-3 in severity. January (mean temperature: -1 F) surpassed 1820 as the coldest calendar month in Post history. Snowfall was roughly 9 inches from four falls. After a bit of a letup over the first six days, minus 20 or colder temperatures just every other morning, a new mass of extremely cold arctic air descended over the area, dominating the weather for four straight days. The 7th was -31 F at 7AM, just -12 F at 2PM, and the mornings of the 8th through 10th registered -32 F, -32 F, and -25 F, respectively. Afternoon readings on these last three days were only -14 F, -10 F, and -10 F, respectively. Dangerous windchills were felt on the night of the 7th, the mercury minus 21 F at 9PM coupled with force 4 (25 miles-per-hour) northwesterlies. Just two weeks having elapsed since late-December’s siege, arctic spells of such severity had never followed each other so closely in the 36-year climatic history. The first thaw in nearly six weeks brought 32 F temperatures on the 16th and 17th, but colder weather quickly closed in again, readings this high not to come again until mid-February. Four consecutive mornings in the -15 F to -21 F range were felt additionally over the last week, and 4 to 5 inches of new snow was laid down over the 28th-29th. Displaying a familiar pattern, February (mean temperature: 11 F) was very cold over the first half, considerably milder over the second. Snowfall was light, a single two-inch fall around mid-month being the only measurable accumulation. Week one brought another arctic blast, the 2nd through 4th -23 F, -31 F, and -27 F at 7AM, respectively. Only -9 F was registered at mid-afternoon of the 2nd, coupled with force 4 (25 miles per hour) northwesterlies. Following all-day subzero readings on the 12th, and -17 F on the morning of the 13th, however, another mid-February “changeover” set in. The rest of the month was thawing or nearly so on each afternoon, the 21st and 26th in the low 40’s. This proved to be only a pause, though, as conditions deteriorated again over early March, the month as a whole the coldest (mean temperature: 19 F) since 1843. Just one thawing day was experienced over the first two weeks, ten of the mornings at 5 F or lower. The 9th was -16 F and the 10th -15 F. Several light snows dropped about 2 inches, the month’s only measurable falls, rain or snow. Warmer temperatures but not dramatically so made up most of the remaining days, diurnal ranges typically in the low 20’s to the 30’s, warmest afternoon of the month, a modest 44 F, coming on the 20th. The rivers at the close were both still locked up in the St. Paul/Fort Snelling vicinity. Mild & Wet April, Dry May – April brought a pronounced warming with generous precipitation. Monthly mean temperature (47 F) was 28 F higher than March’s, and nearly 4 1/2 inches’ precipitation fell on 17 days. No exceptionally warm days were felt, highest temperature all month only 67 F, but this was compensated for by a relatively infrequent freezing nights. 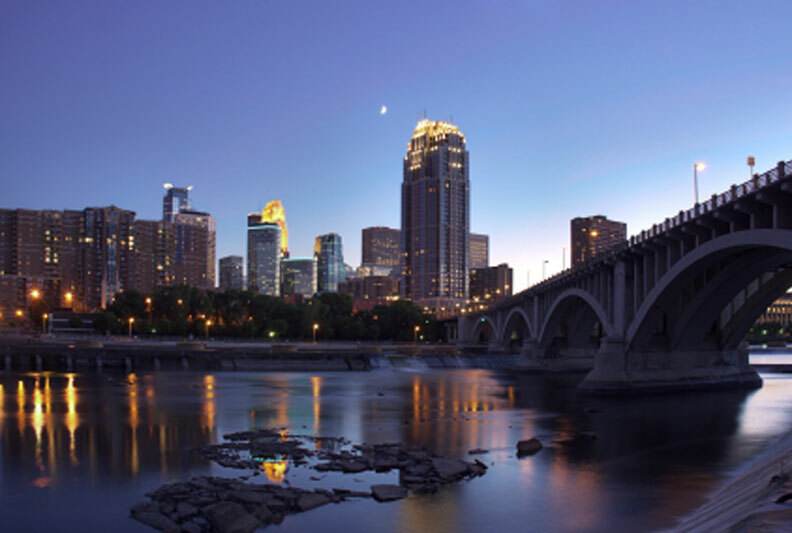 The Minnesota river opened on the 7th, the Mississippi on the 10th. The first steamboat arrived at St. Paul this latter day. A one-day wintry relapse came on the 12th (“very boisterous to-day”), temperatures hovering just above freezing with northerly winds estimated as strong as force 8 (75 miles per hour) with 6 inches’ wet snow accumulated. This brought the ’55-’56 snow-season’s total to roughly 40 inches, less than last year, but still a respectable figure for this pre-Statehood era. May (mean temperature: 59 F) was sunny and much drier with just 1.82 inches’ rain on nine days. Temperatures into the third week showed only slight warming from April, most afternoons in the 50’s and 60’s and just two as warm as the 70’s. But the 19th-23rd brought some early heat, as afternoon temperatures climbed to the mid-to-upper 80’s, including 91 F on the 23rd. The 22nd in St. Paul, as reported by the Pioneer and Democrat, “was a scorcher… the rush for fountains and shade were tremendous”. Cooler but still seasonably warm weather prevailed over the remaining days, afternoons principally in the mid-70’s to low 80’s. Dry Summer – Summer 1856 was frequently moisture-deficient with above normal June/July temperatures. Total rainfall, just over 4 inches, ranked it second to ’52 as the least such amount of the Territorial period. A period of heavy rains in July evidently staved off damage to crops. June (mean temperature: 71 F – warmest in six years) had just three rains totaling .76 inch. Afternoon readings regularly reached the mid-80’s or higher from the first week. The only extended cool spell came over the 11th to 17th with afternoons in the 60’s or low 70’s on six days out of seven. Hottest day of the month was the 23rd with 95 F at 2PM accompanied by force 4 (25 miles per hour) southerly winds. July (mean temperature: 75 F) was hot, sunny, and except for an eight-day spell with almost daily rains, dry. The first week was warm with just a single slight rain on the 1st, most afternoons reaching the mid-to-upper 80’s. But an “extremely opportune” rainy spell set in on the 9th, 2.37 inches recorded on six falls through the 16th. The rest of the month was almost rainless again, the only falls being showers evidently too light to measure on the 26th. The hottest weather prevailed after mid-month with 95 F recorded on the 16th, the 21st to 25th each with readings between 91 F and 95 F. The Daily Pioneer & Democrat remarked on the 24th: “The weather for the last few days has been extremely warm … talk is about sleepless nights”. August (mean temperature: 67 F) continued fair and dry but with considerably cooler temperatures after the second week. Rain fell on seven days to just 1.09 inches. The 1st hit 95 F, the month’s warmest, and the 5th reached 88 F, but these were the only afternoons so warm. Most others were in the mid-70’s or cooler with predominant north to northwesterly winds. Warm Weather Wave in October, Snowy/Cold December – Except for a couple of episodes in mid-September and late-October, Fall continued the pattern of infrequent rains. December, however, provided another snowy and cold introductory winter month. September (mean temperature: 59 F) featured great contrasts in temperature between the first and second half — many days of mid-summer-like heat and humidity over the former, cold and blustery weather over the latter. Total rainfall was 3.24 inches, most coming around mid-month. Afternoon temperatures reached the 80’s eight times over the first sixteen days, many of these, as is the frequent case with September warm spells, being accompanied by strong southerly winds. The 9th and 16th were each 89 F at 2PM, the former a muggy 75 F at 7AM. Following a strong thunderstorm with “hurricane” winds on the 16th that dropped nearly 2 inches of rain, temperatures cooled drastically over the ensuing days, getting no warmer than the low 60’s over the next week. The first killing frost came on the 20th. The 28th and 29th were exceedingly unpleasant, the former “very boisterous the whole day”, some .82 inches of rain falling, accompanied by force 4 northwesterlies. Temperatures were no warmer than the low 50’s. The 29th was quite possibly the coldest feeling September day of the entire Snelling era, the mercury just 42 F at mid-afternoon with force 6 northwesterlies (45 miles per hour). A hard freeze followed overnight, 28 F observed at 7AM of the 30th. October also was a month of variety with early freezing temperatures, unseasonably late warm and sultry weather, and unusually heavy thunderstorms after mid-month. Average mean temperature (51 F) was cooler than either ’52 or ’54, but would rank warmer than any of the next 22 upcoming Octobers, through 1878. Total rainfall was 3.97 inches on five days. Continuation of September’s closing chill, the 2nd recorded 32 F, but in familiar autumnal fashion after an early season frost, strong southerly winds brought a temporary return of summer-like warmth. The 3rd soared to 79 F, highest in more than two weeks, and after a brief cooling, an even warmer (and humid) spell set in, very extraordinary for the season of the year. Spurred by high south to southeasterly winds as strong as force 5 (35 miles per hour), afternoon temperatures on the 7th to 9th reached 85 F, 82 F, and 82 F, respectively. Corresponding 7AM readings were at mid-July-like 68 F, 70 F, and 66 F levels. This being the second week of October, an inevitable and pronounced cooling ensued, the afternoon of the 14th just 47 F. “White frost” was observed on the following morning, the 15th. However, in another bit of unusual October weather, persistent southeasterly flow over the next seven days brought cloudy skies, mild nights (readings frequently in the 50’s), and heavy rains to the area. Powerful thunderstorms over the 19th-24th dropped 3.80 inches, one of the heavier rainfall concentrations ever received this late in the season locally. Cold and dry weather comprised the remaining days, daily ranges typically in the 30’s to 40’s. The 30th’s spread, though, was a wintry 27 F to 32 F. On the 20th, the Pioneer and Democrat had reported that [prior to the heavy rains], “prairie and meadows [were] on fire in the rear of the city… and all around Lake Minnetonka”. November (mean temperature: 31 F) was more seasonable in temperature with a dry first half. The first eight days were cold, the 4th and 5th barely getting above freezing, and the 8th’s range was only 5 F to 21 F. A warming then developed, the mercury reaching 55 F on the 12th for the month’s highest. Most of the rest of the month had afternoons in the 30’s and 40’s with the nights in the 20’s. A series of snows dropped 6-7 inches over the last eight days, the mercury 4 F on the 27th and 5 F on the 29th. December, for the seventh year out of the last nine, was predominated by arctic cold. Average mean temperature (9 F) was equal to that of a year ago, this December’s less intense cold, however, setting in from the very start and persisting almost uninterruptedly throughout. Five of the first eight days dropped below zero, including -11 F and -13 F readings on the 5th and 7th. A warming brought thawing temperatures or nearly so over for several days over the second week, but arctic air then closed in again, thawing readings not to occur again through the close. Nine days out of ten from the 14th on had subzero temperatures, as low as -15 F on the morning of the 15th, the 22nd with some severe windchills, exemplified by the minus 12 F observed at 7AM accompanied by force 4 northwesterlies (25 miles per hour). Start of the snowiest winter yet to be chronicled in Minnesota weather history, twenty inches fell after the 15th; two storms over the 28th-30th dropped 13-14 inches of this.